In rehab therapy, massage is used to remove fluid from limbs that are filled with fluid, relax muscles prior to other modes of therapy, and relax muscles after therapy. • The body is benefited by movement of fluid back into the lymphatic (i.e. edema fluid in the limbs). • Circulation is improved by creating a flushing effect and removal of inflammatory products. • Massage increases relaxation and human-animal bonding. Relaxation massage routines should last only 5 to 8 minutes when first beginning and may eventually last 20 to 30 minutes. Begins at the back of the head with 3 clockwise and 12 counterclockwise small circular movements followed by light squeezing movements (20 to 30 interspersed with effleurage motions). 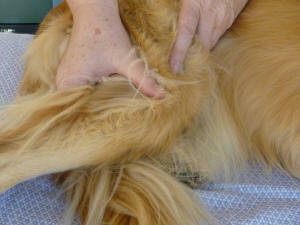 This should help you pet to relax and be more receptive to the remainder of the massage. Follow this by some ear work gently pull the ears outward base to tip, rubbing the tips and rotating the bases. Continue on to the neck muscles squeezing along the entire length of the neck from the skull to the shoulders repeating several times. In large breed dogs this may be followed by neck rocking – the length of the neck to help loosen large muscle groups. The shoulders should be worked next with muscle squeezing and interspersed with light stroking. Follow this with back work – long strokes of light pressure the entire length of the back in a light and smooth rhythm (try to keep at least one hand in contact with your pet at all times). The sacrum is section of the back that connects the pelvis to the body and is best worked on by vibrations and then circular motions (alternating clockwise and counterclockwise). The tail should be stretched with one hand while holding pressure on the sacrum with the other. Form a question mark with the tail and follow it with rotations in both directions. Follow this with muscle squeezing over the lower vertebra. Keep connected with the dog with stroking down the legs with alternating hands, intersperse this with effleurage (movements up the leg). Don’t forget to go back to the front legs or do them with the shoulders. The goal is to promote relaxation with this routine, therefore remember to monitor your pet. This should not be painful or distressing. Other forms of massage may follow this warm up relaxation massage.